How much would you be willing to pay to shave a minute off your commute? For New Yorkers, the answer appears to be around $56 per month. That’s how much more New Yorkers pay in rent, on average, for a one-bedroom apartment that’s a minute closer by subway to Manhattan’s main business districts. “Living in the world of New York real estate, you very quickly realize, is all about trade-offs,” said Krishna Rao, an economist at StreetEasy. Those trade-offs aren’t just about commuting time. Places with short commutes are also often places with other desirable characteristics: restaurants, nightlife and convenience, both in terms of getting to other places in and around the city and of getting people from other parts of the city to come to your neighborhood. Our findings suggest that residents of Williamsburg and other Brooklyn neighborhoods on the L train could soon be paying less in rent. That’s because the MTA plans to close the L train for repairs starting in 2019, adding about eight minutes to commutes from the Bedford Avenue station and about four minutes from other stations along the L. The shutdown should shave about $200 to $450 off the rent of the typical Williamsburg one-bedroom — until the repair work is done, anyway. Meanwhile, according to Jonathan Miller, president of Miller Samuel Real Estate Appraisers & Consultants in New York, rents already have increased near stations planned for the Second Avenue subway on the Upper East Side, which is due to open later this year. StreetEasy’s analysts, using the same set of more than 175,000 listings, took a slightly different approach in its analysis and came up with a smaller estimate of about $33 per minute. More on that later. “Proximity to transportation hubs in a walkable city is a pretty powerful incentive” for renters, said Miller, who added that the $56-per-minute estimate seemed reasonable. New Yorkers may not be typical in how highly they value short commutes; travel time might matter less to renters in cities where a greater share of commuters use cars, or with fewer high-earning residents, or with less desirable urban centers. As any New Yorker knows, this analysis doesn’t capture all the complexities and horrors of the local real estate market. For instance, we’re assigning the same travel time based only on which station is closest to a given home — which doesn’t count time spent traveling by foot, bus or bike to the nearest station, or account for travel to a slightly more distant station with faster train service to Midtown or downtown. That’s a bigger deal the farther you get from the city’s business centers, as subway stops get sparser and walks to the station get longer. That also means our analysis might slightly overstate the value New Yorkers place on saving a minute on their commutes, because the true gap in time between the typical home in Midtown and one in the outer boroughs is greater than just the difference in subway ride time. On the other hand, not everyone works in Midtown or downtown, which means that those who do might value proximity to those neighborhoods even more than our analysis suggests. For its own analysis, StreetEasy used a simpler method to get a similar result. The company’s analysis included all homes, no matter the size, and grouped them together by the nearest station. It looked only at commutes to Midtown, not downtown. It also looked at how the median rent of nearby homes varied by station, and it didn’t account for people boarding at local stations and transferring to express trains. As the chart above suggests, the relationship between commuting time and rent isn’t quite linear. 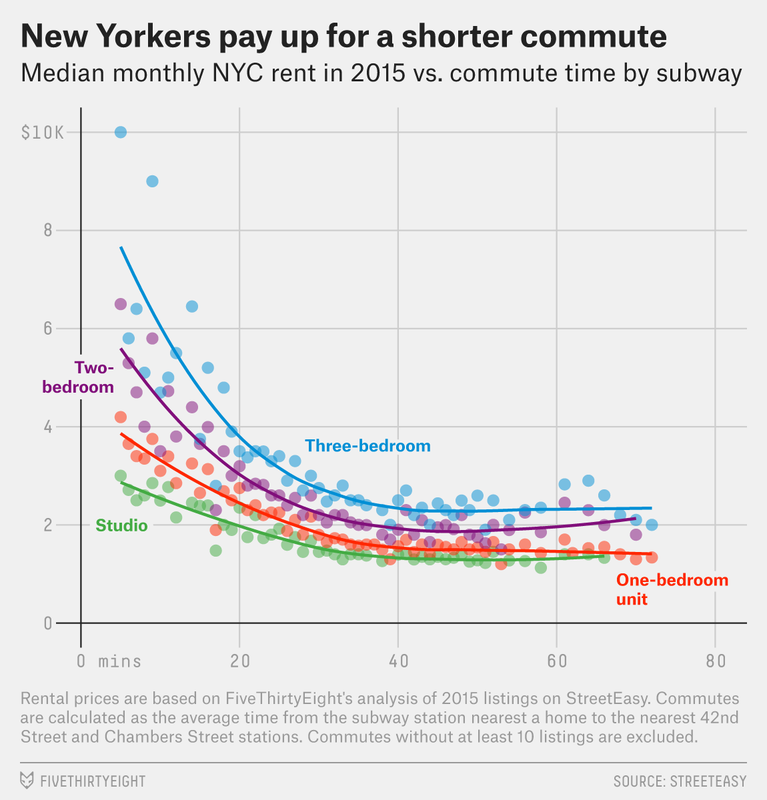 For homes with subway commutes under 30 minutes — a group that includes the majority of StreetEasy listings — commuting time and rent are strongly linked. But beyond about 30 minutes, the relationship breaks down: Rents for homes an hour away from Midtown look pretty much the same as rents for those just half an hour away. That could be because a one-bedroom home an hour from Midtown is bigger, on average, than one 15 minutes away: The analysis treated a two-bedroom single-family house the same as a two-bedroom apartment. It could also be because for people who either don’t have to commute by subway (because they’re retired or students or working from home or take a car to work) or don’t mind longer commutes, those outlying neighborhoods bring other charms, like proximity to the beach. Manhattanites in most neighborhoods south of Harlem live in households earning over $100,000 a year, which is about twice the median household income citywide. For Midtown, we used any of the 42nd Street stations — at Eighth Avenue, Seventh Avenue, Sixth Avenue or Park Avenue, roughly representing the center of Midtown. For downtown, we used any of the stations on or just south of Chambers Street — West Broadway, Church Street, Broadway and Centre Street. The 42nd Street stations and some other Midtown stations are used more than most downtown stations, but that isn’t a perfect proxy for how much they’re used by commuters who live in the five boroughs. Midtown is the point of entry and exit for people traveling from outside the city via major bus and train stations, and it has more traditional tourist attractions such as Times Square and the Empire State Building. For its travel-time estimates, StreetEasy used subway timetables, adding time for transfers. We also ran separate regressions for time to Midtown and to downtown, and to whichever of the two areas could be reached the fastest, and got similar results. According to the StreetEasy data, rent typically increases by about 30 percent among homes near the same subway station for each step up in number of bedrooms. We also ran regressions across all homes in the data set, controlling for the number of bedrooms, and found that the average value of being a minute closer to Midtown or downtown was about $85.